Posted in Feature Column, Top Fives. It’s all well and good seeing who is the best of the weekend but how about the worst. This is not a team you want to be getting in to. Donkey Team of the Weekend: West Brom The West Brom showing at Norwich was inexcusable and had Steve Clarke turning various shades of red in rage. Norwich is a difficult place to go to certainly but to concede four times to one of the least effective attacks in the league when you are considered one of the better defenses was bad but the manner of the goals was horrendous. All four came from West Brom errors either indirectly or glaringly directly. Ben Foster – West Brom Rob Green must be breathing a sigh of relief not to have ended up in this team after two errors but he was forced in to one of those. Foster had a nightmare. He is a solid keeper but he is prone to unbelievable errors. His massive air swing at the ball with his favoured left foot gave Grant Holt an easy tap in and Norwich survival in the league. He also spilled the ball twice in his box as if trying to corral a bar of soap. 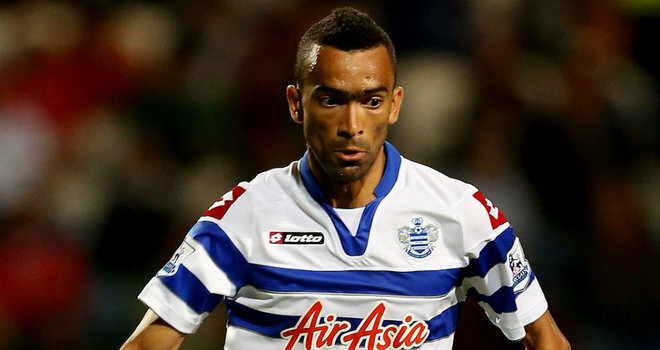 Jose Bosingwa – QPR This was the worst individual 45 minutes of the season. 45 minutes, because he was subbed off at half time having cost his team two goals and flattened them after a nice start. Not bad for £55k this week. Point at two of the QPR fans in the crowd and the chances are their combined salary this year doesn’t match what Bosingwa got for this 45 minutes. He gave away a ridiculous penalty and then an awful hospital pass to Rob Green gave Newcastle what would prove to be the winning goal. He didn’t even look like he cared that he was humiliating himself and his wage payer either. Jonas Olsson – West Brom Olsson has been reliable and consistent for West Brom for some time but he was terrible at Carrow Road. He was indecisive and ineffective and cost them the first goal. He also got himself in Foster’s way to cause his error. Not what you expect from him. Gareth McAuley – West Brom Own goal, four goals conceded, misplayed offside to cost a goal. Oh dear. Like his partner McAuley has been a rock this season but he was not at it. Normally a calm influence at the back he couldn’t help swing the tide as West Brom collapsed in the second half. Goran Popov – West Brom It says a lot that his direct opponent Robert Snodgrass made the Team of the Week yet Popov finds himself here. He didn’t come close to stopping him and the majority of the Norwich threat came down his flank. He also didn’t offer much help or width going forward and was lucky not to suffer the fate of Billy Jones the right back who was taken off at half time. 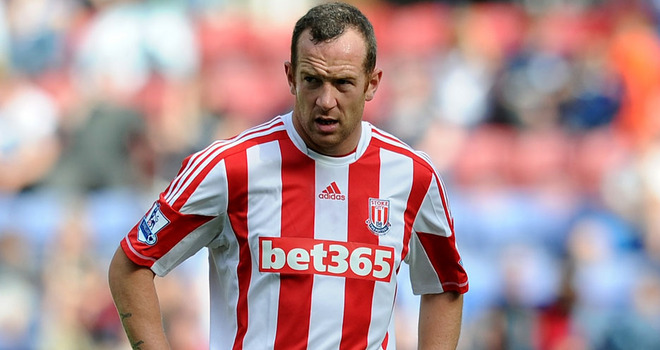 Charlie Adam – Stoke City It’s 1-1 at half time in the Stoke Spurs game with Stoke looking to give their home fans something to cheer about to end the season. Charlie Adam, on a booking after clattering Jan Vertonghen, steps out for the second half having already completed a stunning 9 of 15 passes for a truly amazing 60% pass success rate and a mind blowing 0 out of 3 long passes. So what does he do? He lunges in from behind, no where near the ball, and gets sent off. Thanks Charlie, see you next year. 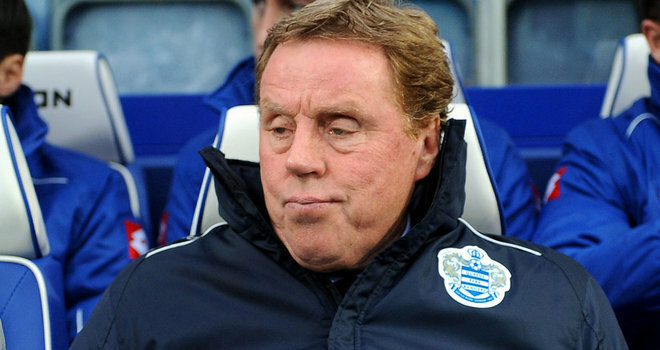 Stephane M’Bia – QPR I’m not sure why Harry Redknapp played him with his open courting of a return to Marseille in the week but he repaid him with a performance of impressive ineptitude. How does this take your fancy? 15 passes completed, 3 fouls. WOW! It’s hard to pick out players from the QPR Newcastle game because it was so awful Hatem Ben Arfa aside but M’Bia’s was notable. Ramires – Chelsea Chelsea needed to beat Aston Villa to secure Champions League football for next season. They were 1-0 down to a Benteke goal when, on 44 minutes, Ramires gets himself idiotically sent off. What makes it worse is that he was actually playing fairly well until he got himself sent off but he is very lucky not to have cost his team with his ill discipline. If Benteke hadn’t lost his head and Frank Lampard rescued them Chelsea would have lost. Giorgios Karagounis – Fulham Playing in central midfield Karagounis was responsible for stopping the roaming Coutinho and also for giving central supply to Dimitar Berbatov. Well, Coutinho ran riot throughout the game, including making two goals from the middle of the pitch. To add to this, Karagounis completed a measly two of thirteen passes within 25 yards of the Liverpool goal. In other words, he lost the ball 11 times with Fulham on the attack. Jon Walters – Stoke City Walters played on the right of the five man midfield but essentially as a second striker. He tries hard and people admire his work rate. But if you look at what he actually did against Spurs it will be horrifying for Stoke fans. Although probably not, because bless him he runs hard. Walters recieved the ball 21 times in the game. With this, he completed just 11 of 18 passes, 0 successful dribbles and 0 successful crosses. So he was -10 on turnovers on his own, he lost it 10 more times than he received it. Giving the ball to him resulted in negative outcome on 10 of the 21 occasions. But, he does run hard. 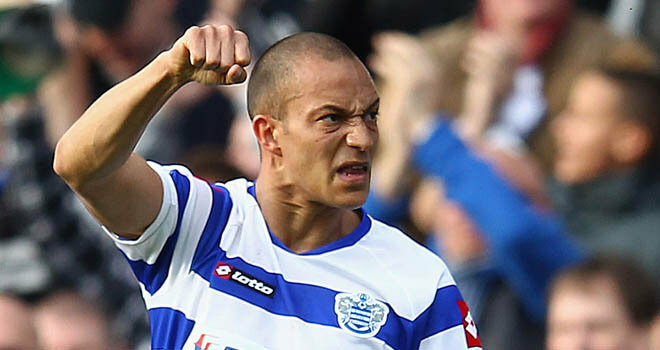 Bobby Zamora – QPR The Donkey of the Week by a long way which is impressive in this company but look at this; Do you want a striker who has admitted he doesn’t enjoy the game or feel any passion for it? Do you want to pay him £50k a week? Do you want him to have 0 shots on target, one final third pass and for him to lose out in aerial duels twice as often as he wins them? And also to complete just 52% of his passes. Of his passes! At least Walters has dribbles and crosses in his ridiculous possession surrender. Zamora gave it away 14 times just by passing. he didn’t even attempt a take on and had a failed cross. A spectacular display of atrociousness. The Weekend Awards are a somewhat serious, somewhat tongue in cheek affair in summary of the best and worst of the Premier League. The usual drama followed the Premier League circus this week, so what was the best and worst? I guess you could nominate the send off to Sir Alex Ferguson at Man United and it would run this close but to me Lampard’s was a moment that might not have happened. Where Ferguson is in complete control of his retirement, nicely timed for a league winning Old Trafford celebration that also allowed David Moyes a home farewell, Lampard had to rely first on being played, and then on getting those elusive goals to reach the record. When it became clear at the turn of the year that Chelsea weren’t looking to keep him and in his increasingly deep role opportunities for goals looked scarce. It seemed that the goal record might be out of reach. However, he kept professional, didn’t become selfish and kept racking up the goals and wins to drag an exhausted Chelsea back to the Champions league next season. He actually is a Leader and Legend and should always be the captain when he plays. Never mind some of his deplorable team mates, Chelsea need him to be the face of their club for next season. Charlie Adam, Cristian Benteke and Ramires all got two yellow cards. Bare that in mind. None of them got straight reds. They combined for 147 minutes out of a possible 270. None of them lasted more than an hour. For two bookings? And it’s not as if the bookings were unavoidable. All of the offences which brought second yellows were just ridiculous decisions and Adam and Benteke cost their team badly. Ramires was lucky to be saved by the Lampard show. This was magisterial goal that should show anyone that doubts the football that David Moyes can get United playing exactly what they are capable of. Leighton Baines started the move deep in his own half and after laying the ball off he blazed forwards in to space. After some nice one touch passing Baines was found precisely by Fellaini and he dummied inside before laying it back to the Belgian. Fellaini then nudged it on to Pienaar who immediately put it straight in to Mirallas’ path and his finish with one touch from the edge of the box was unerring. Lovely stuff. As always, Pulis used his post match comments to excuse another Stoke showing which was despicable in it’s lack of ambition, quality and entertainment by talking absolute rubbish about the referee. He said that when Adam slid in on a yellow card he ‘gave the referee an opportunity to send him off’. The implication is that the referee couldn’t wait to send him off and that this was an outrageously soft decision that would only be given against Stoke. It’s pretty simple really. You can’t tackle from behind. It’s a booking. It’s a foul even if you get the ball now. Adam didn’t get the ball and was on a booking. Guess what happens next then? Strangely, during this diatribe he didn’t mention that Stoke only managed six shots all game with the only one on target being the goal. It also must have slipped his mind that his team managed an eye watering 69% passing accuracy which includes a breath takingly bad 72% accuracy on short passes. He also didn’t say that his team commited twice as many fouls. But here’s the big one. In 90 minutes of football Stoke created three chances to score. Three! But that isn’t why they lost, it’s because of the red card. Anyone who hadn’t seen the incidents in question from the QPR Newcastle game would be forgiven for thinking that the referee had a horror show. But, he didn’t. Redknapp was upset about the penalty awarded against Jose Bosingwa but Bosingwa near enough had Ben Arfa’s whole shirt in his hand and hauled him away from getting in a shot. It’s just clearly a penalty. Pardew was bafflingly complaining about the red card for Rob Elliot the goalkeeper. Elliot was booked already and then decided to catch the ball outside his penalty box. Not near, not on the line, but clearly outside. So it’s a red card right? Weird. Another to add to Rob Green’s blunder list which thanks to the atrocity committed by Ben Foster isn’t even the biggest howler, but certainly the most mind bendingly bizarre. Armand Traore passes the ball back to him in the box and for some reason Green bends down to pick it up. Maybe he think’s it’s 1991 and it’s allowed again. Its not Rob. Adding to the comedy was Mark Lawrenson’s Match of the Day analysis in which he blamed Traore. Considering this is dominating the awards given with a question and exclamation mark it says a lot. Newcastle are safe because of this result. Because of this, they are allowed to play in the Premier League next season. But, by Harry Redknapp’s own admission, QPR are not a Premier League team. They have an expensively assembled bunch of mercenaries with no fight or ability. And Newcastle only just beat them because Jose Bosingwa donated them a penalty and then an open goal after selling Green up the river with a heinous back pass. That’s it. That’s all Newcastle had to do to stay up. There’s a lot wrong up there. Posted in Fantasy XIs, Team of the Week. The Weekend Awards are a somewhat serious, somewhat tongue in cheek affair in summary of the best and worst of the Premier League. Touch and go at top and bottom so here’s what stood out. If Wigan had lost to West Brom they would have been 5 points from safety with 3 to play instead, with the win they are just two points behind Sunderland, 3 behind Norwich and Newcastle and 4 behind Southampton. And they’ve got a game in hand on Tuesday at home to a Swansea side who have nothing to play for. Interesting. If they win that and Sunderland beat Stoke tonight then suddenly Fulham up in 12th would be just 2 points off the drop and in poor form. For the neutrals a Wigan win over Swansea would make for an incredible end to the season at the bottom. What a let down the two Sunday games were. The Merseyside derby was a fairly uninspiring 0-0 and Manchester United Chelsea didn’t get going until it was too late. All four teams looked like they knew they had done their important business for the season, even though Chelsea needed to beat United. There was a distinct lack of quality and edge to both games and made for an unsatifying few hours. This was both an aesthetically pleasing and vitally important goal. The inch perfect pass from Ashley Westwood followed Agbonlahor’s clever run between the two centre backs and he ended up peeling all the way around Bassong from his blind side. By the time Bassong had seen what was happening the perfect positioning of the pass combined with Agbonlahor’s express pace meant that the Villa striker was through on goal. He kept a calm head to slot home and was able to celebrate in front of the traveling Villa fans as his side recorded another key win. So the clock is running down on what is a meaningless game for United when Rafael gets embroiled in a little squabble with countryman David Luiz. Rafael has a little kick out and Luiz throws himself to the floor before looking up and smiling at his compatriot. He then makes sure to look anguished as referee Howard Webb arrives on the scene amidst a sea of card waving from Oscar and Ramires (both Brazilian) and the inevitable denoument. So much for national pride. This one is deceptive for two reasons. Firstly, the temptation is to say ‘Well if Reading had played like that more often they would have stayed up’. Yeah well they didn’t, so they haven’t. They played with the freedom and abandon of a team that had no pressure. For Fulham the temptation is to think ‘Oh well, they’re safe anyway’. But the thing is, they’re not yet. If Sunderland and more importantly, Wigan, win their respective game in hand then Fulham would only be two points off the relegation zone with 5 defeats in their last 6 games. They are quietly in a tailspin and need to find a win but they have a potentially rampant Liverpool visiting next before a tricky trip to Swansea. If they get zero points they will be looking nervously elsewhere. It’s getting a bit old now but Spurs really are dependent on Gareth Bale. Without him they’re certainly not a top four team. He was kept quiet all game with some canny tactical set up by Southampton which resulted in an awful Spurs showing in a grinding 0-0. It looked like it would end like that before SuperBale cut in from the right and in trade mark style and hit a fading shot in to the far corner of the goal. Yeah, Newcastle aren’t great but they did finish 5th last year so it’s not like Liverpool have just put 6 past the 2007/08 Derby County team. 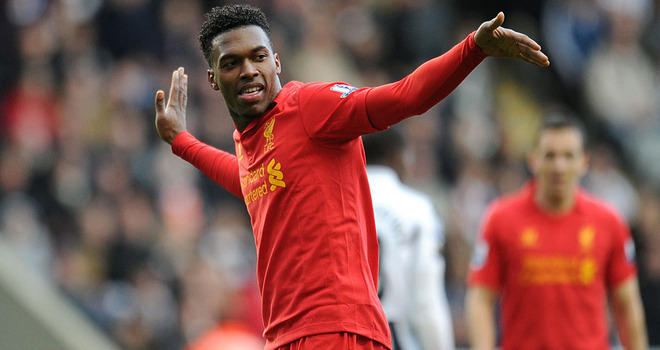 Without Suarez a lot was expected of Daniel Sturridge and I tipped him to be successful on the Premier League Stock Exchange and so it proved. Thrust in to his preferred central spot he scored two, including one special one, of which more later. He ran rings around the defence and opened up a whole world of space for Player of the Week Coutinho to run riot in his most impressive display of many since arriving in January. The rejuvenated Jordan Henderson looked great in midfield as did Gerrard and Lucas. Is this the real Liverpool or is it the one that drew 0-0 twice in a row against West Ham and Reading? The great frustration for their fans. This game was an embarrassment for both football clubs; the players, management and most importantly, the fans. Fair enough, you’re going to draw 0-0 from time to time, particularly two sides which lack a proper goalscorer. But what cannot be forgiven is the lack of application and any sign of quality and purpose that both sides were blighted by. This wasn’t the lively Reading that have pushed big teams at the Madjeski this season. Both teams seemed to be playing an end of season friendly to prepare for next season and it was a disgraceful ‘effort’. For the second week in a row it is an excellent Sturridge finish from a sublime pass which wins this. Coutinho robbed Ben Arfa on the halfway line, sauntered forwards up towards the Newcastle box whilst Steven Taylor ran away in panic and then flipped the ball up and over him straight to Sturridge who steadied himself before lashing the ball in to the roof of the net. Beautiful and savage in combination. You’re in the drop zone, you’re against Spurs, you’ve got Gareth Bale hounding you in your own penalty box. Do you a) smash the ball out to safety? or b) try and play your way out? Well unfortunately for Wigan Figueroa and Robles chose the latter. Robles had two chances to pump it away, Figueroa one, and neither chose to. In the end the denouement was humiliating for Robles who tried to chip it over the onrushing Bale but just kicked it straight at him and it flew in to the net. Oh dear. It was bad enough that Sagna had lost a sloppy ball to Robin van Persie by under hitting what was already a difficult ball to play correctly, but then after van Persie had been shown wide by Per Mertesacker Sagna launched a sliding tackle in to him from behind with the inevitable result of a penalty which was slammed home. A moment of zero danger against a lack lustre United suddenly became a disaster and cost Arsenal two precious points. This was deceptive because Everton should have absolutely battered Fulham. The likes of Fellaini missed easy chances against a Fulham team that seems to be on an early summer holiday having secured safety. Everton might well have steam rollered Fulham and yet somehow nearly squandered even what they had. Lukaku is the answer to Chelsea’s problems if they will just realise it themselves. He was dominant against Southampton and was responsible for all three goals as West Brom surprisingly won 3-0 at St. Mary’s against an in form Southampton unit. He ran the recently decent Saints defence ragged. Making his debut in the Premier League Madley had an outstanding game, and contrary to idiotic commentary, a game he would dream of. He gave three red cards, all of which correct. He had a goal given when the ball crossed the line before being hacked out and allowed for a positive flow to the game. Whilst I’m here, why wouldn’t the referee have wanted to give three red cards? If anything, it showed that he wasn’t intimidated by his new surroundings and made correct decisions. Who cares how many reds he dishes out if they are all fair? He had an excellent game.